“La La Land” isn’t perfect, but you’re absolutely forgiven if you want it to be. The classic Hollywood musical shows up these days only in bastardized forms like live televised stage shows and music-video extravaganzas and the occasional film adaptation of a Broadway warhorse. The real deal — those widescreen Technicolor dreamlands where audiences got to fantasize about bursting into song and dance as casually as walking down the street — are part of the cultural past while remaining everyone’s hidden secret, even in the tell-all world of social media. In other words, you and I sing and dance inside our heads all day, with unerring footwork, tunefulness, and grace. It’s just that no one ever sees it, because the world’s not supposed to work that way. Except in musicals, where it does. Thus the opening number of “La La Land,” which illustrates our dilemma and its ecstatic release. We’re in Los Angeles, which means we’re in a traffic jam. It’s the morning commute and the off-ramp is a clogged artery until one woman’s hopeful inner monologue becomes outer song, and she gets out of her car and starts dancing, and then she’s joined by others, and then others, and suddenly the screen is filled with human bodies wheeling in delight as far as the eye can see. The number is a little ragged, but it’s definitely right. In that traffic jam, in separate cars, are a man and a woman, Sebastian (Ryan Gosling) and Mia (Emma Stone). She’s an aspiring actress and current barista on the Warner Brothers back lot. He’s a jazz pianist and a stiff-backed musical purist. Their first interaction, involving honked horns and flipped birds, doesn’t go well. Their second, in the piano bar from which he has just been fired for excessive bebop, goes even worse. But this is La La Land, where everyone’s in show business and the merry-go-round always brings us back around to each other. Mia and Sebastian meet archly at a pool party in the hills where he’s playing in an ’80s cover band and she’s trying to shake a screenwriter (“They say I have a knack for world building”). On the walk back to their cars, the city twinkling far below, they share a lovely dance duet while singing about how they’ll never, ever fall in love. Fred Astaire and Ginger Rogers they ain’t. Stone’s singing voice is a soulful wisp of a thing. But this is the moment that convinced me the film’s writer-director, Damien Chazelle, knew exactly what he was doing. What his stars lack in training they make up for in relatability. They sing and dance just a little better than we would. Chazelle, a Rhode Island native, is all of 31. His last film was the similarly jazz-besotted “Whiplash” and his first, which began life as a Harvard thesis project, was a gossamer black-and-white musical called “Guy and Madeline on a Park Bench,” shot on the Boston Common and at apartments throughout the greater Allston area. “La La Land” feels like an expansion of that first movie but with the budget and ambition that comes with success. He’s cashing his check early. So it’s a glorious throwback, not only to the MGM musicals of the 1940s and ’50s, when Gene Kelly ham-and-egged his way across a Cinemascope canvas, but to Jacques Demy’s 1964 “Umbrellas of Cherbourg,” itself a love letter to the form. You should see it on the biggest screen possible. There are elements of Scorsese’s “New York, New York” here and if you squint just right, “La La Land” may be the movie that Francis Ford Coppola’s “One From the Heart” (1981) was trying to be. It’s a film for those who feel a little out of step with the 21st century, as Mia does with her love of classic cinema and Sebastian does with his angry jazz certainty. A lot of us can relate. If you can’t, we don’t really want to hear about it. “La La Land” follows the path of true love as it entwines and threatens to come undone over the course of the year, the seasons announced on the screen as a kind of joke because it’s California and the sun never stops shining. The songs are written by Justin Hurwitz (music) and Benj Pasek and Justin Paul (lyrics), and they’re delicate, memorable, and a little tentative, as if no one here is sure they’re going to get away with this. “City of Stars” is Ryan’s big number and “The Fools Who Dream” is Stone’s, and both sound like people murmuring gorgeously to themselves rather than trying to convince the world. Maybe that’s because Chazelle knows everything out there conspires against our musical secret selves. Sebastian wants to open a jazz club for the cognoscenti, for the people who get it, but to prove he’s a worthy boyfriend he takes a job as keyboardist for a popular (and awful) jazz-rock band led by an old friend, played in a sly turn by pop star John Legend. We witness the dejection of Mia’s audition rounds, the dreadful scripts she’s offered, the reality that there are thousands of actresses who look exactly like her. That’s only on the outside, though — one of this movie’s points is that our inner soundtracks, the songs we alone hear and sing, are always unique. 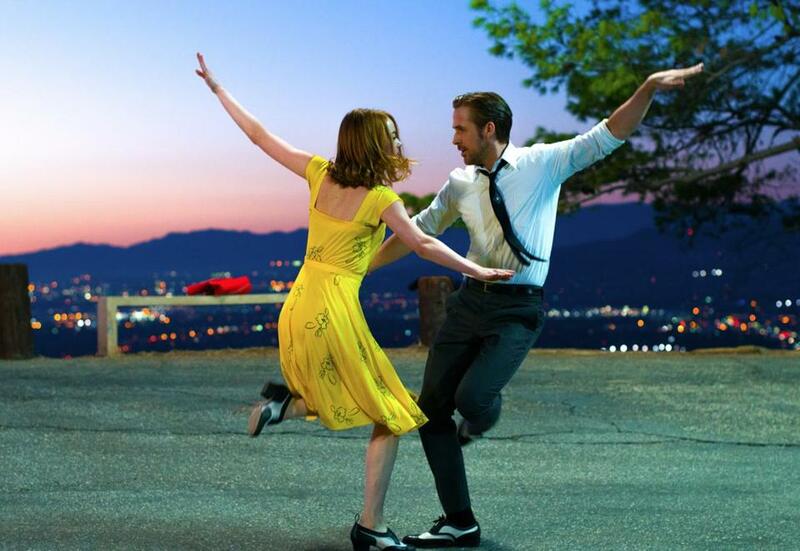 There are moments of unalloyed joy in “La La Land,” including a dance number that breaks free of earthly gravity (the setting, appropriately, is the Griffith Observatory). There are also moments of static, including an unfortunate reliance on people of color as accent notes of authenticity in a white romantic playground. That’s part of Hollywood history too, one that Chazelle seems to mirror unconsciously and too well. Mostly, though, the movie traffics in the bittersweet happiness of treasuring things that are vanishing, like the unrealized future imagined in the climactic dance number, or those inky, star-filled dance floors that go on forever in old movies, or Hollywood musicals themselves. Or jazz: Sebastian has an early moment at a nightclub where he passionately sticks up for the music he loves. “It’s dying on the vine,” he says. “And the world says ‘Let it die. It had its time.’ Well, not on my watch.” In that scene, he speaks for the director. By the end of “La La Land,” he’s speaking for all of us. Written and directed by Damien Chazelle. Starring Emma Stone, Ryan Gosling, Rosemarie DeWitt, John Legend. At Boston Common, Coolidge Corner, Kendall Square, West Newton, suburbs. 128 minutes. PG-13 (some language).